Issued at 7:06 pm Tuesday, 6 November 2018. Supercell thunderstorms are bringing damaging wind gusts, large hail and heavy rainfall to the southern NT. Weather Situation: There are currently two large supercell thunderstorms located between Curtin Springs and Finke. The cells are moving to the east. These thunderstorms, as well as other thunderstorms in the area, are in an environment highly conducive to thunderstorm severity. 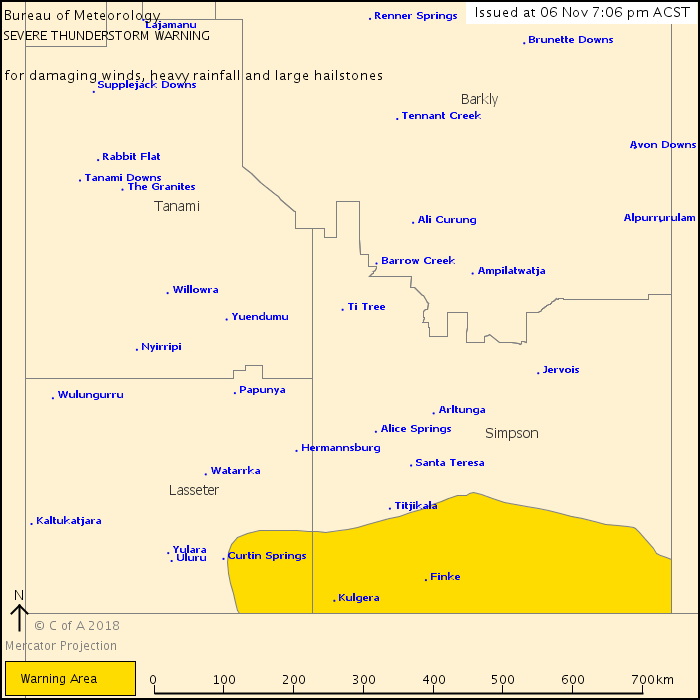 Severe thunderstorms are likely to produce damaging winds, heavy rainfall that may lead to flash flooding and large hailstones in the warning area over the next several hours. Locations which may be affected include Kulgera, Finke and Simpson District east of Finke.